BBC News – Travel site targets Mac users with costlier hotels. News in that Orbitz shunts Mac travel site searchers off to a pricier tier of hotel offerings. Quick, you Safari users, go to “Develop” (you HAVE set up view to show this in menu bar, right?) 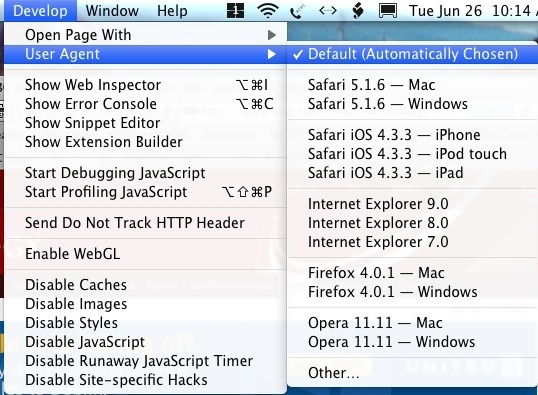 and go to the “User Agent” option and select “Firefox 4.0.1 — Windows”. Then go to Orbitz and get a better deal. Setting the User Agent to Windows returns that you are web surfing on a Windows box to the Orbitz site – save money.